Where can I find out more about Jesus? If you want to know more about becoming a Christian, the first thing to do is to speak to the Minister. He will arrange a short course of instruction during which you can ask questions and clarify your understanding of what is involved before making a decision. Once a person has decided to accept Jesus Christ as their Lord and Saviour, the next step is normally to follow Christ’s command to be baptised. This is a sign of obedience to Christ and a public witness of faith. If you were baptised as an infant, you may still be baptised as a believer. We believe that the Gospel teaches that it is normal for those who have accepted the Lord Jesus as their Saviour to accept His body too. His body is the Church and as Christians we are called to live out our Christian lives in fellowship with other Christians. Church Membership is open to Christians who sympathise with Believer’s Baptism, whether baptised or not. If you are thinking about Church Membership, then have a word with the Minister or one of the Deacons. From the example of the New Testament, Baptists believe that baptism is only for those who believe and are able to declare personally that Jesus is Lord. As a symbol of Jesus’ claim on our lives, we normally practise baptism by immersion, which symbolises the death and burial of our old lives and resurrection to a new life in Jesus Christ. 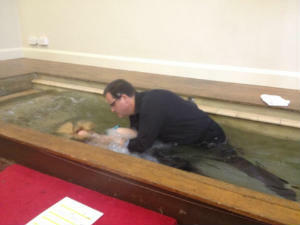 Here is a clip of one of our young people being baptised. 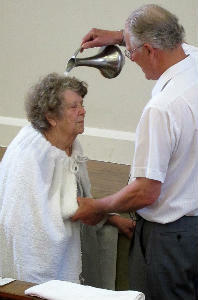 Where immersion is not possible, because of age or infirmity then we baptise by effusion.